"Business goes global, taxes stay local." As indispensable as business restructuring is for enterprises to assure their economic survival, moving business activities abroad always leads to a shift of tax base between two tax jurisdictions. 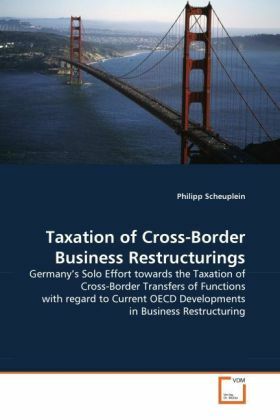 In 2008, there have been significant innovations on the taxation of cross-border business restructuring, namely the German regulations on the transfer of functions and the OECD Discussion Draft on Transfer Pricing Aspects of Business Restructurings. The new German regulations will lead to exit taxation for a wide range of cross-border business restructurings. However, if national regulations are not in line with internationally accepted standards regarding the allocation of taxation rights, double taxation conflicts will inevitably arise. The book compares in a very detailed manner the German regulations on transfers of functions with the OECD Draft on Business Restructurings to show weaknesses as well as potential for improvement using an example from real life. Special emphasis is put on the accordance with international taxation principles and the suitability of the German approach as a template for taxing cross-border business restructurings.